What Does 15 Percent Growth Look Like? Senators Marco Rubio (R-FL) and Mike Lee (R-UT) recently released their tax plan. This plan would lower the tax rate for all businesses to 25 percent, it would integrate the corporate and individual income tax, move to full expensing for capital investments, and enact a territorial tax system. On the individual side it would have two tax rates (15 percent and 35 percent), a new $2,500 child tax credit, and a new refundable personal credit to replace the standard deduction and personal exemption. 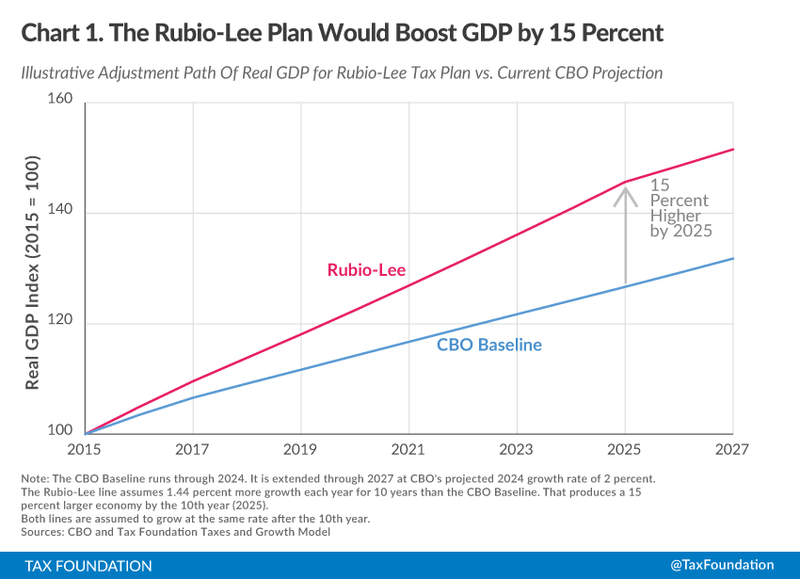 For all intents and purposes, the Rubio-Lee tax plan would change the U.S. tax code into a progressive consumption tax. When we modeled the results, we found that it would increase the level of GDP by 15 percent (over what it otherwise would have been) in the long term. The cost of capital would reduce substantially under this plan. As a result, investment would increase, leading to a higher GDP. Some have said this seems like a very large growth effect, maybe even unrealistic. But in the correct context, it really isn’t that surprising. It is important to interpret the number correctly. The 15 percent growth number is the increase in the level GDP at the end of the adjustment period. In other words, the GDP will be 15 percent higher than it otherwise would have been absent this tax plan. If we take a look at the below chart (from our report), it shows what this would look like. Our model shows that the economy’s growth rate will increase slightly each year until the level of GDP is 15 percent higher than it otherwise would have been. In this example, it takes a decade for the economy to realize all of the growth. The increase in annual GDP growth doesn’t have to be that much in order to reach a 15 percent higher baseline. Over a ten-year period, it equates to additional average growth of about 1.44 percent each year. Let’s use a numerical example: suppose today the economy is $100. We predict that absent any policy changes, the economy is going to be $121 ten years from now. This is a growth rate of about 2 percent a year, the rate at which CBO thinks we will grow. 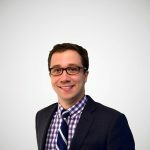 If we were to enact a policy that grew the economy by an additional 15 percent over the long term (about a decade), we would then see an economy of $140.18, or 15 percent larger than we otherwise would have seen. To get to $140.18 from $100 in a decade, annual economic growth would need to be 3.44 percent per year, or an increase in annual growth of about 1.44 percent per year over what was previously predicted. But let’s say you are less optimistic about the amount of time it will take to see 15 percent more GDP. You think it will take 20 years for the economy to grow 15 percent from this tax plan. Absent any policy change, the economy will grow from $100 to $148.59 in twenty years. If we were to enact the plan, the economy will be 15 percent larger, or $170.88. GDP growth would only need to increase by 0.72 percent annually, or a total of 2.72 percent annual GDP growth. (Table, below for full calculations). Is 3.44 or 2.72 percent annual real GDP growth that unrealistic? It’s easy to get pessimistic about U.S. GDP growth. During the last decade, the economy only grew, on average, 1.88 percent per year. However, if you look back to past decades, our economy was growing much faster. 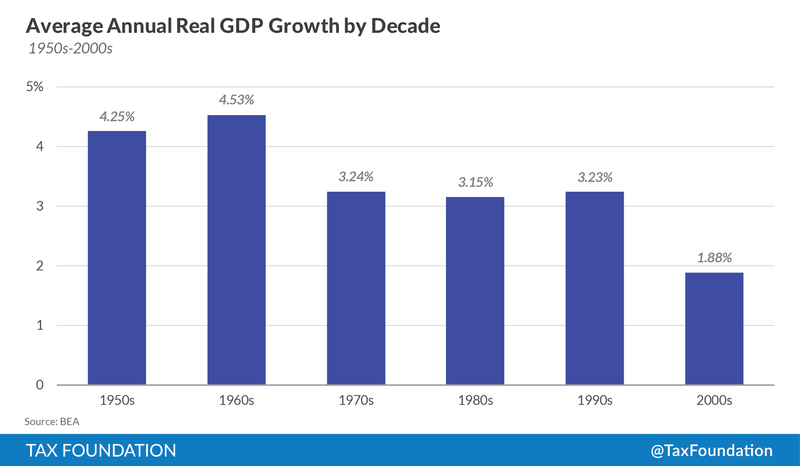 In the 1970s, 1980s, and 1990s, the average growth rate for the economy was a little more than 3 percent. Earlier, the economy grew at an even faster real rate—over 4 percent. If our economy grew at 3.44 percent a year, GDP growth would not be much higher than it was in the 1990s. Is it really that strange to think that a fundamental tax reform plan, which moves to a consumption base, drastically reduces the cost of capital, and reduces the cost of labor would bring us to about the growth rate of the 1990s?